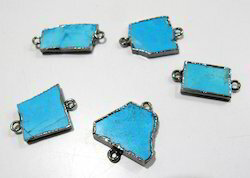 100% Export Oriented Unit of a wide range of products which include clear quartz single loop connector, turquoise magnesite slice connector, smoky quartz slice connector, dendrite opal slice pendant, dendrite opal slice connector and labradorite slice pendant. 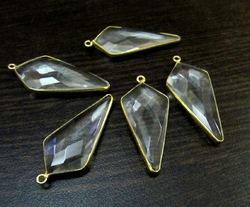 AAA Quality Clear Quartz Faceted Briolette Arrowhead Single Loop Connector Charm / 24 Kt Gold Electroplated Bezel 15 x 35 mm approximately / Single Loop Pendant / Sold per Piece. We are offering this at a very reasonable prices.. Quality is Very Fine. 100 percent genuine gemstone. You can write your preferred colors in the special note , we will try to work on your choice. 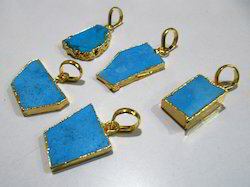 1 Pc.- Natural Turquoise Magnesite Slice Connector / 24 kt Gold Electroplated Edges / Size 1 inch approximately/ Double Loop Connector Charm. We are offering this at a very reasonable prices.. Quality is Very Fine. 100 percent genuine gemstones. 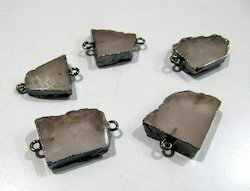 1 Pc.- Natural Smoky Quartz Slice Connector / Black Electroplated Edges / Size 1 inches approximately / Double Loop Bezel Connector Charm. 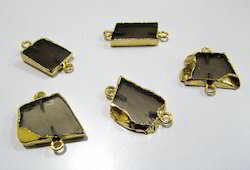 1 Pc.- Natural Smoky Quartz Slice Connector / 24 kt Gold Electroplated Edges / Size 1 inches approximately / Double Loop Connector Charm. 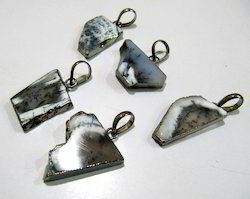 1 Pc.- Natural Dendrite Opal Slice Pendant / Black Electroplated Edges / Size 1 inches approximately / Single Loop Pendant / Connector Charm. 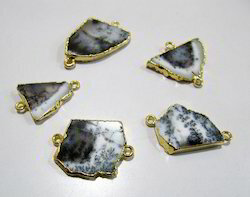 1 Pc.- Natural Dendrite Opal Slice Pendant / Gold Electroplated Edges / Size 1 inches approximately / Single Loop Pendant / Connector Charm. 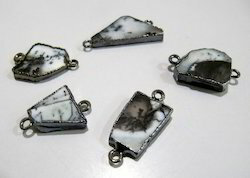 1 Pc.- Natural Dendrite Opal Slice Connector / Black Electroplated Edges / Size 1 inches approximately / Double Loop Bezel Connector Charm. 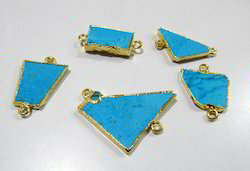 1 Pc.- Natural Dendrite Opal Slice Connector / 24 kt Gold Electroplated Edges / Size 1 inch approximately/ Double Loop Bezel Connector Charm. 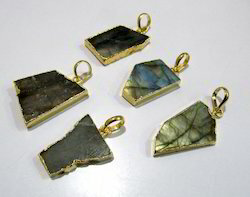 1 Pc.- Natural Labradorite Slice Pendant / Gold Electroplated Edges / Size 1 inches approximately / Single Loop Pendant / Connector Charm. 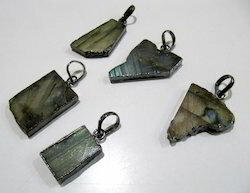 1 Pc.- Natural Labradorite Slice Pendant / Black Electroplated Edges / Size 1 inches approximately / Single Loop Pendant / Connector Charm. 1 Pc.- Natural Rose Quartz Slice Connector / 24 kt Gold Electroplated Edges / Size 1 inches approximately / Double Loop Bezel Connector Charm. 1 Pc.- Natural Rose Quartz Slice Connector / Black Electroplated Edges / Size 1 inches approximately / Double Loop Bezel Connector Charm. 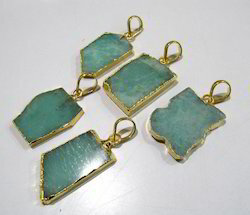 1 Pc.- Natural Amazonite Slice Pendant / 24kt Gold Electroplated Edges / Size 1 inches approximately / Single Loop Pendant / Connector Charm. 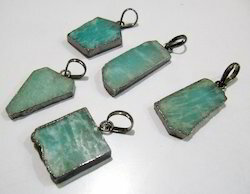 1 Pc.- Natural Amazonite Slice Pendant / Black Electroplated Edges / Size 1 inches approximately / Single Loop Pendant / Connector Charm. 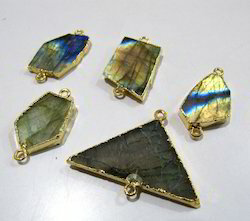 1 Pc.- Natural Labradorite Slice Connector / 24 kt Gold Electroplated Edges / Size 1 inch approximately / Double Loop Bezel Connector Charm. 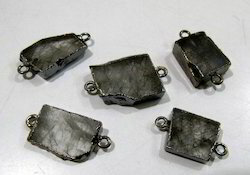 1 Pc.- Natural Labradorite Slice Connector / Black Electroplated Edges / Size 1 inches approximately / Double Loop Bezel Connector Charm. 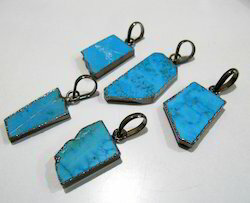 1 Pc.- Natural Amazonite Slice Connector / Black Electroplated Edges / Size 1 inch approximately / Double Loop Pendant / Connector Charm. 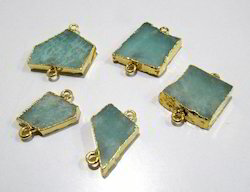 1 Pc.- Natural Amazonite Slice Connector / 24 kt Gold Electroplated Edges / Size 1 inch approximately / Double Loop Pendant/ Connector Charm. 1 Pc.- Natural Rose Quartz Slice Connector / 24 kt Gold Electroplated Edges / Size 1 inch approximately / Double Loop Bezel Connector Charm. If you need more Sizes and Shapes and stones which are not listed please let us know, we will make special listing for you. If you have any questions, please contact us through. Message service or e-mail. 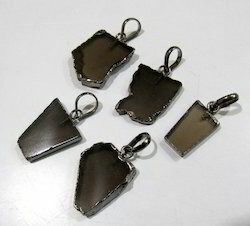 1 Pc.- Natural Smoky Quartz Slice Pendant / 24 kt Gold Electroplated Edges / Size 1 inches approximately / Single Loop Pendant / Connector Charm. 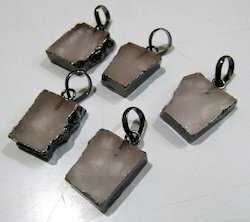 1 Pc.- Natural Smoky Quartz Slice Pendant / Black Electroplated Edges / Size 1 inches approximately / Single Loop Pendant / Connector Charm. 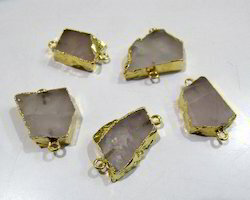 1 Pc.- Natural Rose Quartz Slice Pendant / 24 kt Gold Electroplated Edges / Size 1 inches approximately / Single Loop Pendant / Connector Charm. 1 Pc.- Natural Rose Quartz Slice Pendant / Black Electroplated Edges / Size 1 inches approximately / Single Loop Pendant / Connector Charm. 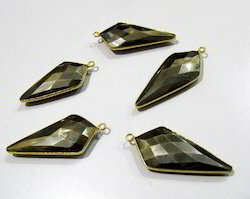 AAA Quality Natural Pyrite Faceted Briolette Arrowhead Single Loop Connector Charm / 24 Kt Gold Electroplated Bezel 15 x 35 mm approximately / Single Loop Pendant / Sold per Piece. 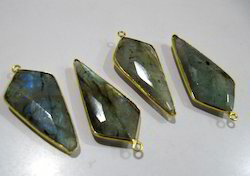 AAA Quality Natural Labradorite Faceted Briolette Arrowhead Single Loop Connector Charm / Gold Electroplated Bezel 15 x 35 mm approximately / Single Loop Pendant / Sold per Piece. 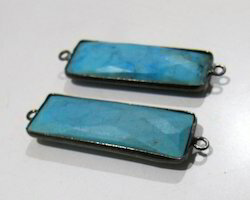 AAA Quality Natural Turquoise Magnesite Baguette Shape Briolette Connector / Double Loop Bezel Connector 30x12 mm / Black Oxidize Connectors. If you would like more let us know through onvo. 1 Pc.- Natural Rainbow Moonstone Connector / Black Electroplated Edges / Size 1 inch approximately / Double Loop Bezel Connector Charm / Blue Flashy. 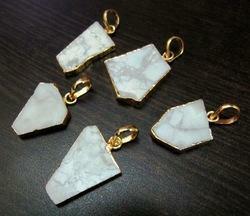 1 Pc.- Natural White Agate Slice Pendant / Gold Electroplated Edges / Size 1 inches approximately / Single Loop Pendant / Connector Charm..
1 Pc.- Natural White Agate Slice Pendant / Black Electroplated Edges / Size 1 inches approximately / Single Loop Pendant / Connector Charm. 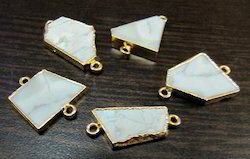 1 Pc.- Natural White Agate Slice Connector / 24 kt Gold Electroplated Edges / Size 1 inch approximately/ Double Loop Bezel Connector Charm. 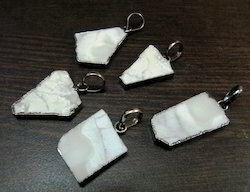 1 Pc.- Natural White Agate Slice Connector / Black Electroplated Edges / Size 1 inches approximately / Double Loop Bezel Connector Charm. 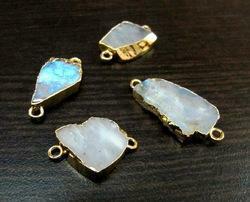 1 Pc.- Natural Rainbow Moonstone Connector / 24 kt Gold Electroplated Edges / Size 1 inch approximately / Double Loop Bezel Connector Charm / Blue Flashy. 1 Pc.- Natural Black Rutilated Quartz Connector / Black Electroplated Edges / Size 1 inch approximately / Double Loop Bezel Connector Charm. 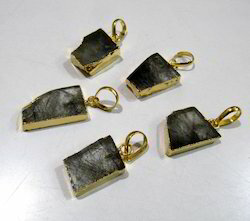 1 Pc.- Natural Black Rutilated Quartz Connector / Gold Electroplated Edges / Size 1 inch approximately / Double Loop Bezel Connector Charm. 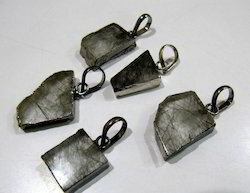 1 Pc.- Natural Black Rutilated Quartz Slice Pendant / Black Electroplated Edges / Size 1 inches approximately / Single Loop Connector Charm. 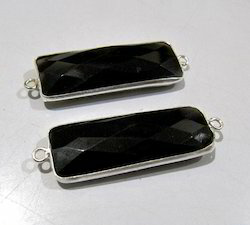 1 Pcs.- AAA Quality Natural Black Onyx Baguette Shape Briolette Connector / Double Loop Bezel Connector 30 x 12 mm / Silver Plated Connectors. 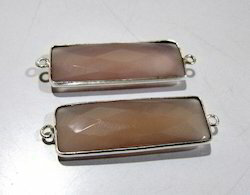 1 Pcs.- AAA Quality Natural Pink Chalcedony Baguette Shape Briolette Connector / Double Loop Bezel Connector 30x12mm / Silver Plated Connectors. 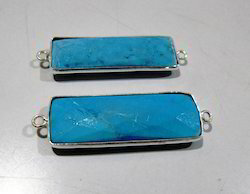 AAA Quality Natural Turquoise Magnesite Baguette Shape Briolette Connector / Double Loop Bezel Connector 30x12 mm / Silver Plated Connectors.